Contemporary country singer/songwriter Brad Paisley was born on October 28, 1972, in Glen Dale, West Virginia. Brad Paisley started playing guitar, writing songs and playing live at an early age. Brad Paisley was invited to appear on Wheeling station West Virginia's famed Saturday night broadcast Jamboree USA. Paisley's debut was so well-received that Brad Paisley was invited to join the program full-time. During college, Brad Paisley secured an internship with ASCAP. The contacts Brad Paisley made there helped Brad Paisley land a songwriting deal with EMI. American singer, a songwriter, and musician, Brad’s music style crosses between traditional country music and southern rock. Brad Paisley won the Entertainer of the Year award at the 44th annual CMA Awards on November 10, 2010. Paisley has been performing professionally since he was 13 years of age. He brings humor and pop culture references to his songs, which make his music all that more entertaining. Brad Paisley last appeared at the Houston Rodeo on Saturday, March 17, 2012, for the Spring Break Stampede. Brad Paisley's debut album, "Who Needs Pictures" was released in 1999 on Arista Records. The album spun two chart-topping singles. "Part II" was released in 2001 and returned Paisley to the Billboards Top Five Charts with "Two People Fell in Love" and "I'm Gonna Miss Brad Paisley (The Fishin' Song)." This album spun four Top Five Singles. 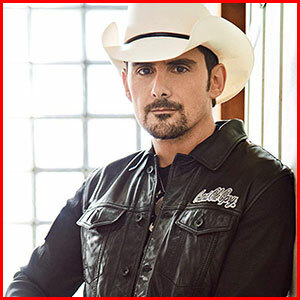 Houston Rodeo Tickets Online is your source for Brad Paisley rodeo tickets and all your entertainment needs. Order tickets online.